Halibut and Wine Tasting at Seattle Fish Co. March 31st! 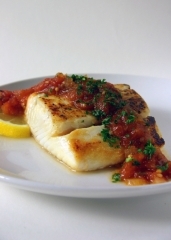 On Thursday, March 31st, from 5-7pm, Seattle Fish Co. hosts a Halibut and Wine tasting featuring Pan-Seared Halibut with Spicy Tomato Chutney, prepared by the famous chef and food critic Erin Coopey. Courtney Wolff from Unique Wine Company will be pouring a selection of 7 fantastic whites chosen specifically to complement this dish. Plan ahead and take advantage of this free opportunity to enlighten your taste buds.